The Rolex Day-Date watch is already one of the brand’s most exclusive (and expensive) models. But, add a dash of diamonds, and now we have an exceptionally lavish Rolex President on our hands. So, grab a loupe (or a pair of shades) for a closer look at the dazzling Rolex Day-Date ref. 118348. The Rolex ref. 118348 is an 18k yellow gold Day-Date with a diamond bezel. In fact, this gold President boasts 52 diamonds on the bezel. But it doesn’t stop there. The champagne dial on this particular version of the Day-Date ref. 118348 is further embellished with the white precious gems. The eight round diamond hour markers (1,2,4,5,7,8,10,11) are joined by two baguette-cut ones at six and nine o’clock. Also on the dial, are the pair of windows for which the model is named after. The day window at 12 o’clock displays the day of the week, while the one at 3 o’clock hosts the date. Of course, in true Rolex fashion, the date is magnified by the Cyclops lens on the sapphire crystal. The Day-Date is a exclusive and expensive model. The dial is housed within an Oyster case measuring 36mm. The 36mm option was originally the only size available for the Rolex Day-Date. However, there are now two other sizes: Day-Date II at 41mm and Day-Date 40 at (naturally) 40mm. Yet, the 36mm remains the most popular. This is probably because, not only is it a classic choice for the Rolex Day-Date, but it also suits both a man’s and a woman’s wrist. A true unisex luxury dress watch, indeed. The inaugural Day-Date made its debut in 1956 as the first wristwatch to indicate both the date of the week written in full, in addition to the date. It was presented on a bracelet—distinguished by semi-circular links—dubbed the President bracelet. This bracelet is part of the reason that the Day-Date is commonly known as the Rolex President. The other part is because it has always been a popular choice among world leaders, including American President, Lyndon B. Johnson. Count the diamonds, we dare you. The Day-Date is also favored in circles outside of politics including celebrities, top athletes, business leaders, and Rolex enthusiasts and collectors. As well as the President nickname, tt’s also sometimes called the Rolex Presidential. To match the impressive exterior looks of the Rolex Day-Date ref. 118348 is the just as impressive Caliber 3155 on the inside. An in-house automatic mechanical movement, Rolex introduced the Caliber 3155 in the late 1980s. Three decades later, and the 3155 still powers today’s Day-Date 36 models. Like all Rolex movements, the 3155 is certified by COSC. Along with powering the time, date, and day functions, the Caliber 3155 also has the double quickset feature. This means that day and date adjustments are independent of the center hands. This is super practical for the wearer, particularly for those who travel a lot and have to regularly change the time and date. Similar to all non-diving Rolex Oyster Perpetual models, the Day-Date is waterproof to 330 feet due to its Twinlock screw-down crown and fluted caseback. 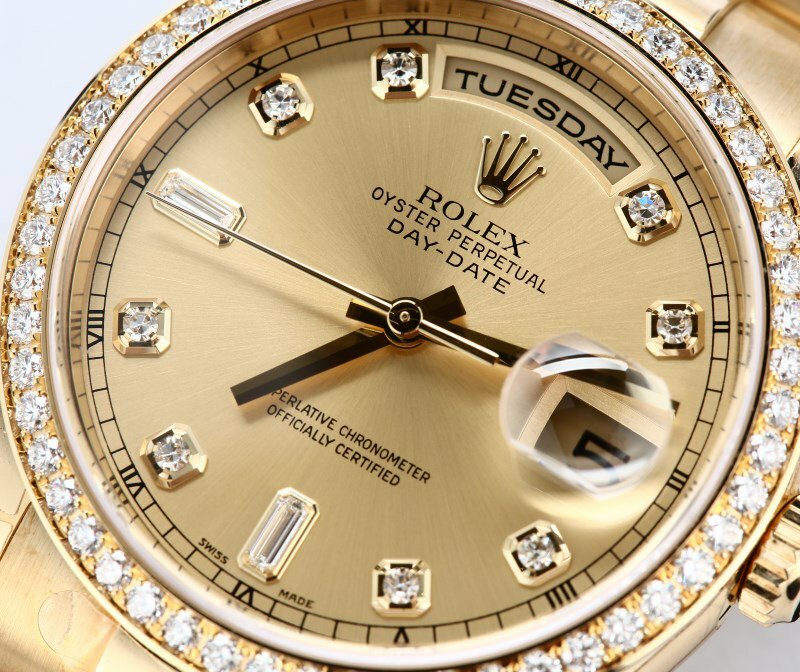 The 18k yellow gold and diamond Rolex Day-Date ref. 118348 is an exquisite jewelry watch for men and women. 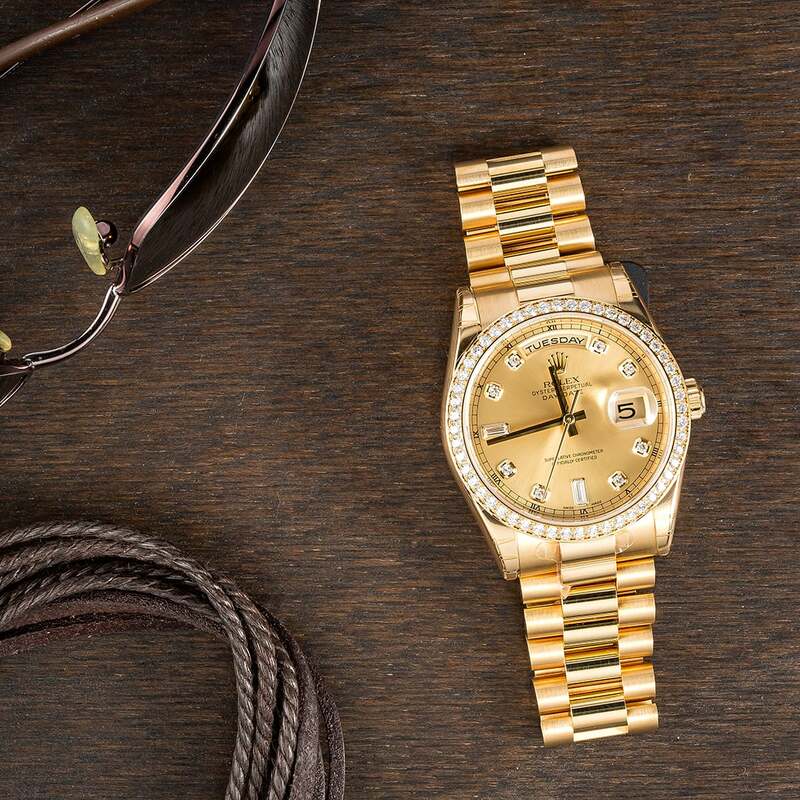 Unabashedly luxurious, this is a Rolex watch that definitely has our vote. Are you a fan of diamonds on Rolex watches?